We believe that to craft a home that will serve for centuries is a noble profession worthy of our deepest respect. In contrast standard conventional home construction involves the assembly of pre-manufactured components into homes with brief warranties. Most construction work is seen as a “ blue-collar affair”, not a real profession. Is there a place for the true artisan in our fast-paced consumer culture? We have seen a growing interest and acceptance of our work because there is a growing segment of the population that chooses quality over quantity, simplicity over life in the fast lane and a will to steward the environment above all else. This small but growing segment of our population is the support system for the re-birth of the American artisan and a culture based in respect for nature. We have been deeply inspired by the precedent set by our European and Asian contemporaries who have kept the ancient building traditions of their cultures alive. Through the Timber Framer’s Guild we have been exposed to master craftsmen from around the world. In Japan we witnessed the Kezurou Kai hand planning event. In India we observed Shilpis carving stone temples and statues in granite with the perfection of their ancestors. 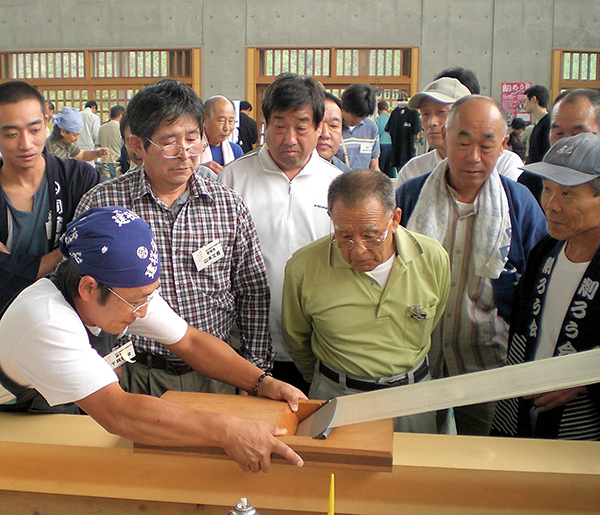 A crowd of carpenters watch with admiration as master carpenter Senga-san produces a silk-like shaving at Kezurou-Kai planing competition in Japan.